Now I did do a search on this and did find lots of info on here,but I still have a few questions. 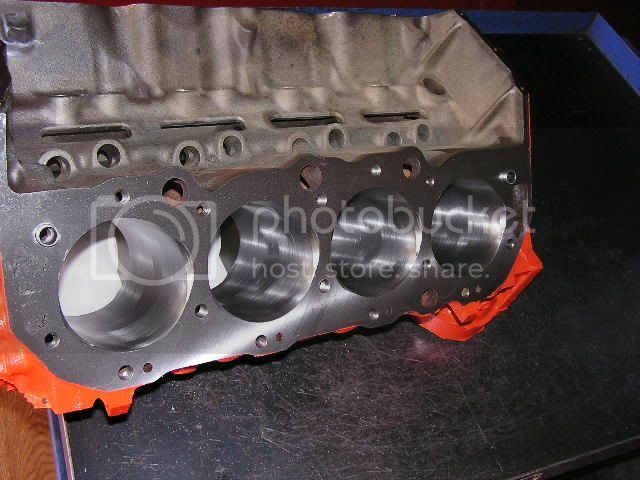 I have a friend,who bought a used 396bbc(.060 over)that had a set of GM 990 cast iron rectangle port heads on it. I told him that those heads were way to big for the little rat,and suggested he find some Brodix 270cc BB-O oval port heads to use instead. So he happened to find a brand new set of the Brodix 270cc oval ports that a guy had for sale and bought them. Now I have them here and I'm mocking up his engine and find that there is only .020-.025" clearance between the intake valve and cylinder wall @.600 lift. So I'm thinking,dam that's close the intakes are 2.25" and the bore is 4.155",and from searching on here I realize that the valve is over the 53% rule. 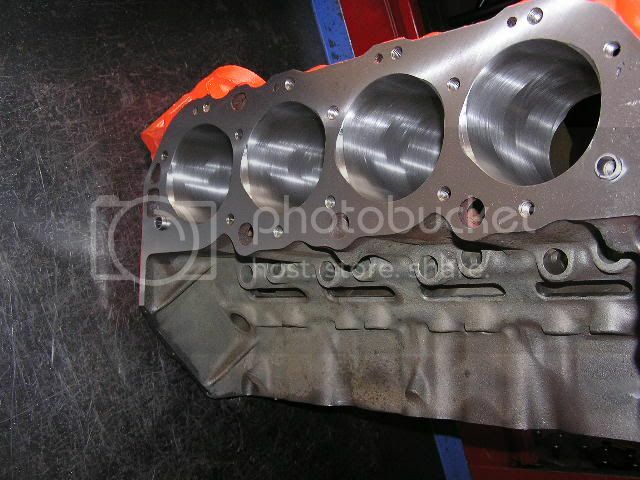 Now after finding all this out,I searched for more info and found this build on Superchevy's website,where they built a 408bbc with the Brodix heads and 2.25" valves . I suggested to my friend that we just build a 496bbc,but he says he has already spent to much money on this little rat and is afraid his wife will divorce him if he keeps spending more! Anyhow what do you guy's suggest. What application does he want the motor for ? I'm pretty tight also with my 454/AFR305 heads with 2.25 valves. I forget how much clearance I had, but look at the pic. Hasn't blown up yet! Grind a nice bevel from .060" above top ring travel to the deck surface in each cylinder. You may not be able to match the chamber wall, but some is better than none. Unkl Ian wrote: What application does he want the motor for ? Oh ya, sorry about that. This is just going to be a street/strip combo,going into a 69 El Camino. The pistons are old TRW closed chamber slugs with 43cc domes,so it should have around 10.25-1 compression with the 119cc Brodix heads. We were also planning on running a solid street roller as well. Here is a great thing to do to help your situation out. As already posted, grind an "eye brow" in the top of the block. With the cylinder head on as on your picture, take a sharp wire/scribe bent in a "J" shape that will allow you to reach up from the bottom of the bore and scribe a line in the top of the deck that is blocking/shrouding your intake valve. Once the line is scribed on all of your cylinders, remove the head and grind this relief in the block. Take care to not grind below the top ring. This procedure, will increase air flow into the cylinder. If I remeber right, both Darin Morgan and Maxracesoftware have had customers that they have put in smaller intakevalves, both motors gained over 1000rpm power range. So,other than reworking the top of the cylinder notch,do any of you have any problems with the .025" clearance we have between the valve and cylinder wall? When,I questioned Brodix about this they recommended a min. of .070". I can't see any witness marks on the cylinder walls from when it was running the 2.30" valves and having only .005" clearance,so is it safe to say it should be fine? Anyone know what the factory valve size was on a L78 396bbc? Re: Valve to wall clearance? Rommel Racing wrote: So,other than reworking the top of the cylinder notch,do any of you have any problems with the .025" clearance we have between the valve and cylinder wall? Check out the article in Popular Hot Rodding Engine Master's magazine titled, "Relieved For Power". It is a good article that shows and explains on how to do the valve reliefs on the block. If you put the reliefs in the top of the bore, be aware of where your ring gaps are when you install pistons. Especially the oil ring scraper rails! Yeah, I learned that one the hard way. How close are the exhaust valves to the bore? Have you considered using offset dowels? The exhaust valves are not so sensitive to being near the cylinder wall. The valves are to big for that bore and grinding a relief in the bore is not as good as using the right size valves. But I guess that you are stuck with the stuff you have so I would offset the heads and grind reliefs. If the seats are cut smaller than the valves you could always cut the valves down a little. Erland. Brian Rock wrote: If you put the reliefs in the top of the bore, be aware of where your ring gaps are when you install pistons. Especially the oil ring scraper rails! The 318 Mopar motor likes reliefs too, if installing 2.02 intake valves...I was able to get away with no reliefs but I bet its pretty close right now-and the flow is being hurt. Might not have thought about the ring gaps as the pistons get pop in, Thanks again. This am I had a BBC iron head on the flow bench to verify numbers for a customer. In thinking about this post I moved the head over on the stand to unshroud the chamber and valve, Head picked up almost 12cfm. Unshroud the valve, it is free horsepower! Yep, you could always use the Manley .030" offset dowels and move the heads over, . .
and gain some power, ..